Yesterday, I used the London cycle hire scheme for the first time. I had checked all the instructions on how to hire a bike online before heading off to the nearest cycle station, all prepared with my cycle helmet and my payment card. For various reasons, it was dark and drizzling by the time I got there. 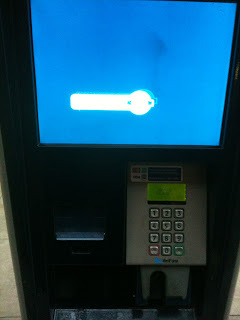 The cycle station display was well illuminated, so I could go through the early stages of the transaction without difficulty, but then it came to inserting the payment card. Ah. No illumination. No nearby streetlight to improve visibility. I found myself feeling all over the front of the machine to locate the slot… which turned out to be angled upwards rather than being horizontal like most payment card slots. I eventually managed to orient the card correctly in the dark and get it into the reader. Several steps of interaction later, the display informed me that the transaction had been successful, and that my cycle release code was being printed. Nothing happened. Apparently, the machine had run out of paper. Without paper, there is no release code, and so no way of actually getting a cycle from the racks. The developers have clearly thought through the design well in many ways. But subtleties of the ways the physical and the digital work together have been overlooked. Why is there no illumination (whether from street lighting or built into the cycle station) for the payment card slot or the printout slot? Why is there apparently no mechanism for the machine to detect that it is out of paper before the aspiring cyclist starts the interaction? Or to display the release code on-screen to make the system more resilient to paper failure? Such nuanced aspects of the situated use of the technology in practice (in the dark and the rain) have clearly been overlooked. It should be a universal design heuristic: if you have a technology that may be used outdoors, check that it all works when it's cold, dark and damp. Especially in cold, dark damp cities.